When Songmics reached out to me so I could review some of their products, I was graciously overwhelmed. They have so many awesome products to choose from. I did finally decide on two different products. One of which I'm going to share with you today! The Songmics bamboo lap desk is finely designed and crafted with a natural finish. It is durable and practical. You can use it as a laptop table, reading desk, breakfast tray and a working desk. It's convenient for using in bed, on the floor, sofa, recliner car, and more. This desk is a great choice for those who like eating breakfast in bed. The USB cooling fan makes it better dissipating the heat of your laptop or maybe save you a laptop cooler. My favorite features are that is completely adjustable, perfectly compact and portable, and that it features a cooling fan in bedded so you don't have to worry about over heating. 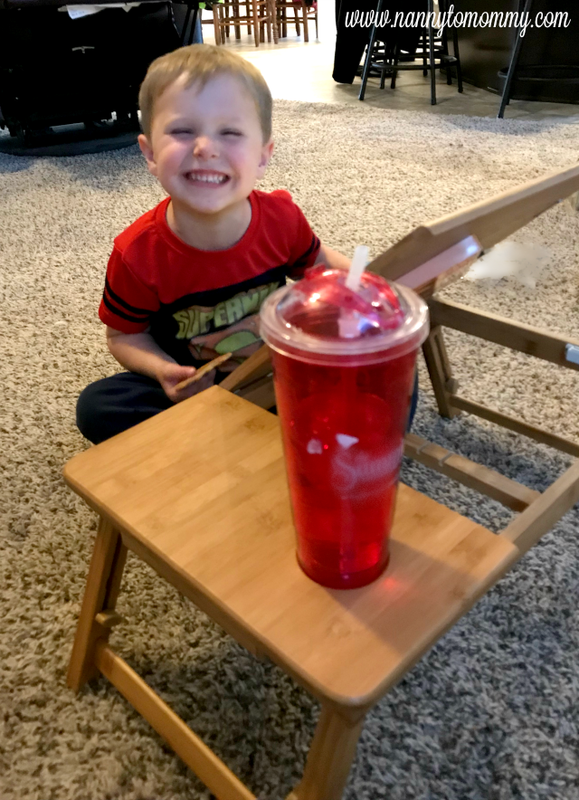 My son has loved using it so he can sit in the living room with a snack and his iPad. I am thinking about giving this to my father-in-law since he will be having some pretty serious surgery soon and I know he would like to be able to still enjoy his computer while in bed. I personally think this would have been really handy when my babies were little too since I was hardly ever able to actually use my desk since I work at home and use my laptop constantly. Plus it's great for serving breakfast in bed as well. There really is so many uses! 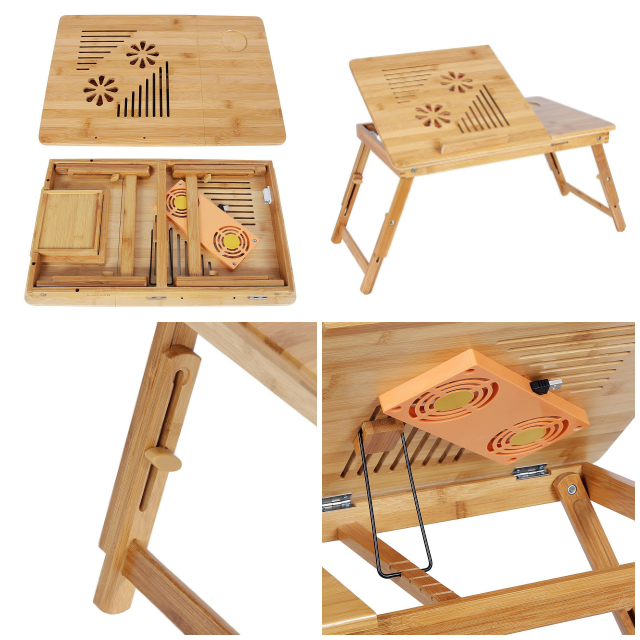 One lucky Nanny to Mommy reader will win a Bamboo Laptop Desk from Songmics! Entry is simple, just follow the prompts on the Rafflecopter below. Open US only, must be 18+ to enter. Winner chosen via Random.org through Rafflecopter. All winning entries are verified. Please follow us on Facebook to stay up to date with our current giveaways. Good luck! 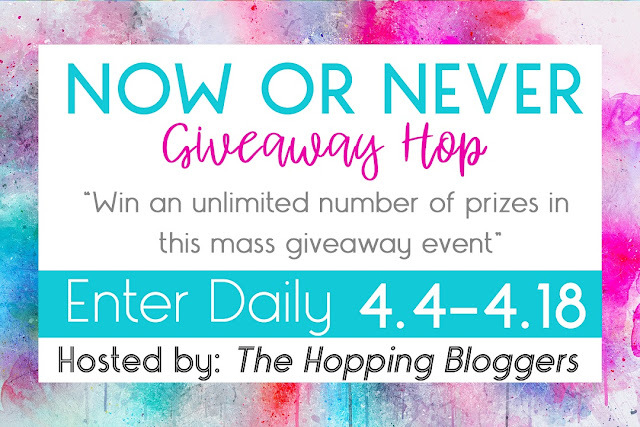 Welcome to the Now or Never Giveaway Hop brought to you by The Hopping Bloggers! Disclosure: I received complimentary products to provide this post. All opinions are my own. Nanny to Mommy and participating bloggers are not responsible for sponsors who do not fulfill prizes. This contest will run through April 18, 2018 at 11:59 EST. No purchase necessary. US entries only. Must be 18 years or older to win. This promotion is in no way sponsored, endorsed, or administered by or associated with, Facebook. You understand that you are providing your information to Nanny to Mommy and not to Facebook. Please note that Nanny to Mommy and other participating bloggers are not responsible for sponsors that do not fulfill their prizes. We have represented each sponsor with the expectation they will fulfill their prize in a timely manner. We will contact the sponsor regarding your prize(s). The sponsors, in most cases, are shipping their items to you directly. I will make every effort to assist you obtaining your prize. If there is an issue with a sponsor, please notify the blog you won a prize from within 4-6 weeks for assistance, after that we may be unable to assist you. This would be for my boyfriend and I! I also like their ladder shelf bookcases! This will be for me! I really need this! I like the SONGMICS Folding Storage Ottoman Coffee Table Foot Rest Stool. I like the color brown too. I like the SONGMICS Folding Storage Ottoman Coffee Table Foot Rest Stool. Not only does it store things discreetly, it also could go with my home’s decor. Some of my favorite songmic products are the pet treats and toys for my shihtzu. Id love to use this laptop desk for myself! If I won this laptop desk it would be for me. I am constantly using my laptop in bed or on the couch and this looks like it would be great! I work full time as a freelance writer and this laptop desk would be perfect for me! At Songmics, I also love their Plush Dog Bed Cuddler. It is comfortable enough for me to sleep on - if I were the size of our dog! Thanks for the super giveaway opportunity! I’ve actually had the Songmics Bamboo Laptop Desk on one of my Amazon lists for awhile. I did not know that Songmics offered so many different items! Thank you for that info and thank you for sponsoring this Giveaway. This would be for me if I won! It's exactly what I need. This would be for my daughter who loves gaming and learning on her tablet and laptop. This would be for my cousin! This would be for me, right now I use a pillow to my laptop on lol. I also like the Folding Storage Ottoman Coffee Table Foot Rest Stool. I'm winning this one for the twinsters. I have to say I love this, so it would be for me. If I won this I'd keep it for myself to use on my recliner! Another Songmic product I like is the SONGMICS Cat Tree Condo House with Sisal Scratch Posts Kitty Furniture Grey for my fur-baby! I would love this for use with my laptop. I also like the SONGMICS 2-tier Shoe Bench Organizing Rack Entryway Storage Shelf! I like the shoe bench organizing rack. My daughter would like this laptop desk. I would definitely use this laptop desk if I were lucky enough to win it! I have Rheumatoid Arthritis, so I cannot sit at a desk for very long without being very uncomfortable. It helps a lot to be able to relax in my recliner or in bed. :) I also love the SONGMICS Mesh Office Chair, this looks very comfy! this would be for my daughter as we just got her a new laptop last week and she could use this while in the living room working on homework. I like their cat condos pet cat scratchers and dog beds! This would be for me, I would love it. It would be for my daughter but I'm sure that I would probably use it too! This would be for my daughter. I like the Extendable Bathtub Tray Caddy. Love this, I would keep it and use it in my living room. Thanks for sharing. The extendable bathtub tray, for me! Love this product! I would definitely use it, as would my children! I also like the shoe bench organizing rack! Thanks! I would give this prize to my daughter. This would be for me. I like the SONGMICS Soft Comfortable Pet Dog Bed Plush Coddler-Medium. I love the featured product best. But i also love the SONGMICS 43" Faux Leather Folding Storage Ottoman Bench, Storage Chest / Footrest / Padded Seat. So many uses for it and i'm wondering how i've lived without it for this long. I would give this to my husband if I won. I like the SONGMICS Vanity Table Set. I would just love to have this Laptop Desk! My laptop desperately needs to be replaced, but I just don't have the money right now. It overheats all the time (its underside gets REALLY not to the touch), and it really worries me. I do have a laptop stand with two cooling fans inside, but so far I've had to replace the cord (it became frayed and stripped)-- and, I need to figure out how to reattach an important part that broke off. Everything that I've seen from Songmics looks fantastic! I love the laundry sorters, as well as the shelving unit that your blog is offering in a separate giveaway. Who was the lucky winner? !